Topic: Biomechanics applies principles from physics and engineering to understand how living organisms move and function as living machines. At the same time, an engineering perspective can be quite limiting in understanding how living systems evolve, because engineers are often focused on finding and designing optimal solutions, whereas evolution rewards solutions that are just good enough. 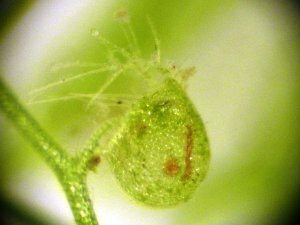 Using high-speed cameras to observe and analyze in detail the too-fast-for-the-naked-eye-to-see movements of fish, and other small organisms—insects, carnivorous bladderworts (see image above)—Fresno State biologist Dr. Ulrike Müller studies how these tiny creatures seemingly defy engineering to move in remarkably efficient ways. Dr. Müller shares insights from her research, some thoughts on the silly creationist notion of intelligent design, and on structural constraints in education systems that limit the participation of women and other minorities in science. The interview with Dr, Müller is followed by a commentary by Dr. Andrew Rhys Jones on urban water policy and what social science tells us about human behavior in the context of California’s ongoing drought, and how science can inform policy during this crisis. Note: Pardon the slight glitch in the recording where we were unable to capture the opening few seconds of the show, so it seems as if we are jumping into the middle of it – but its only a few seconds.